However while our project has been in motion for the last few years we have always had a small audience. This September a group of American study abroad students came to Maromizaha for the first time, and many of them brought along great ideas for the project. A few of them are continuing to assist us and with their help we believe we can make our project more widespread and more well known then it has been in the past! We are now happy to announce the start of our first GoFundMe page! Through this we believe we can make donating to this amazing cause easier and more effective then ever before. With the holiday season we hope to reach our goal of $10,000! With this money we know we can run our small project for the next year! 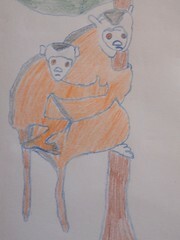 All while conducting more necessary research on how mother Indris and Diademeed Sifakas care for their young. Through this data collection process we are able to provide reliable jobs for a team of locals that have proven to be effective and never failed us. The other component in which the major portion of this money will go to is providing scholarships for young outstanding students which are in need of money to attend school! Thank you so much for reading this and taking part in this project! The link below will bring you directly to our GoFundMe page! Hello beautiful wonderful people all over the world! Greetings from Port Hardy, where Alastair and I have just spent a couple of sensational weeks up on the Central Coast of British Columbia. 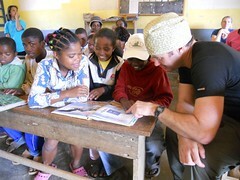 In a couple of weeks I am flying from Canada to Madagascar for my TENTH trip!!! I never would have imagined in that first year that I would still be so committed to and intertwined with the lives of the lemurs, the village and the life in Maromizaha. Once again, we are looking for support to fund scholarships to allow students to go to school, to pay wages for my local assistants and maybe help cover some of my costs. Please take a look at what your money will go towards, and let me know if you can help in any way. As always, your money will be given directly from me to the child, or assistant, and there are no ‘administrative costs’ associated with this project. This year we have two students who are starting University!!! I’m not entirely sure what their costs will be but I am determined to make sure they are covered. Tonight I fly out in the middle of the night and make my way to Canada, where I will be presenting at the Marine Mammal Conference in Halifax next weekend (that other hat I wear) before heading back to New Zealand. My local monitoring team is currently following 5 baby sifaka and their mothers 6 days a week. FIVE baby fuzzy fluff balls of cuteness of a Critically Endangered species of lemur, so very precious. I added them up and I now have records for 27 infant sifaka!!! And some of my Moms have had 4 babies since 2011 and one of them has had 5!!! My local monitoring team is composed of 7 people this year (Ndrenusolo, Raelison, Olga (who had a baby in January named Alex), Suzy, Herve and Vonjy. Vonjy is 6 months pregnant so after this week she is on data entry only, (although she wanted to keep working in the forest) and a new assistant who we are training, named Nasa will take some of her shifts in the forest. The team has work from late June through to Dec 23. Thanks to many kind donations from all over the world, we were able to provide scholarships to 28 students. I also decided to give some money to Olga to replace school supplies for her two children who lost everything in the cyclone (the house they were in was right near a river and the house completely flooded). Of the students supported this year, 10 are newbies entering our western equivalent to middle school (6ieme), 3 are entering 5ieme (next level up), 4 are entering 4ieme, 3 are entering 3ieme. We have 2 students that are entering 2ieme (our equivalent to upper level highschool) and 4 that are entering 1iere. Finally, perhaps my absolute biggest glow from this trip was learning that two girls from our original cohort, Tina and Hollandine, who have received top marks and ZAZA scholarships every year since 2011, are this month starting their final year of pre-University courses. If this happens, these two girls will be the first ever from the village or surrounding villages to finish their schooling and maybe even go to UNIVERSITY!!!! Thank-you so SO very much to everyone who has supported this trip and who has been a part of this project in one way or another. Without you, this just wouldn’t happen, and so I am immensely grateful. Thank-you especially to my wonderful husband Alastair who has been involved since the start and who this year is guaranteeing the wages for the entire local monitoring team. Another season set to begin! 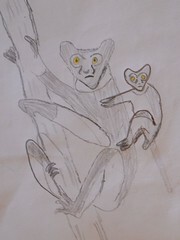 I found out recently that I received my research grant from PCI to get back to Madagascar this September. Yay! So that will cover my flight and a few other things. We currently have enough in the ZAZA local monitoring team account to pay the local assistants to start up work in a few weeks and continue until late August. Past that we still need to continue fundraising. Another thing I found out this season from the local Peace Corps volunteer was that when he asked the older students in the village what they wanted to do when they grew up (he was putting on a work shop with career professionals, doctors, teachers, etc. ), they ALL said they wanted to work in the forest when they grow up. Being a guide for researchers in the forest is seen as the best, most reliable, enjoyable and well paid work by kids in the village!! This year, lemur researchers and educators around the world are celebrating the 105 types of lemurs, found only in Madagascar, for a whole week in October (25-31). If you would like more information about the festival or would like to participate in any way, start by visiting the GERP webpage here: http://www.gerp.mg/ or the WLF Facebook page (Lemur Festival 2014). I hope you are all doing well 🙂 Alastair and I recently got back from a trip to Hanoi, Vietnam, where I presented at the International Primatological Society Congress. We also took some time after the conference to travel around and see some of Vietnam’s primate species, and celebrate a little bit because…. On July 10 of this year I defended my Ph.D. at the University of Victoria, and so now I am officially Dr. Jody Weir, and not a student anymore, for the first September in 5 years! The hardest part of this transition has been wondering when and how I would get back to Madagascar. There has been a remarkable ‘baby boom’ in Maromizaha forest this year and I am so grateful that we have our ZAZA Local Monitoring Team working to follow the infants during their first 6 months of life. Within our 5 focal groups of diademed sifaka, we have 8 infants this year, and within 5 focal groups of indri, we have 3 infants!! My wonderful parents, hearing how much I wanted to get to the forest, check in with my team and see all these infants, have gifted me a flight to Madagascar as a graduation present -Best Present Ever!! This means I will be able to follow up with the research, the Local Monitoring Team and the ZAZA Scholarship Program in October when I get there. The ZAZA Scholarship Program is about to enter its fourth year of scholarships. We are hoping to provide scholarships to 40 students this year (each scholarship is valued at approximately $100 USD) and we are only a about $600 USD short of attaining this goal. 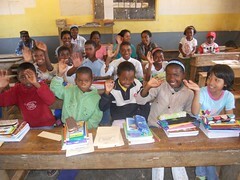 School is compulsory for children 6–14 years old. 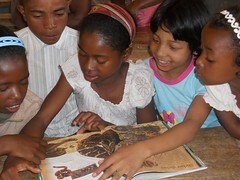 The public education provides primary schooling for the first 5 years (ages 6-11). After that, students/parents are required to pay fees that essentially pay the teachers/administration etc. in addition to paying for their uniform, notebooks, book protectors, pens, compasses, rulers, and all other needed supplies. 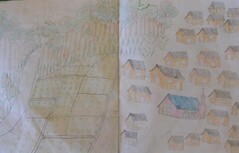 In addition, if there isn’t secondary education school (see next section) in the village, then students need to travel to the nearest village with a school each day, or, in most cases they pay room and board in the village with the school and stay there Monday-Friday and go home on weekends (school year runs October-June). This is the case in Anevoka and Beforona, the two villages nearest the forest where I work. Working with teachers in the area we calculated that the cost for a child to go to school outside their village is roughly $100. Since most people live off their land, and by cooperation/trading with neighbors for food, cash is not something that most people have in these villages. Most people do not have cash, or need the little that they have for food, and so most children do not go to school past year 5. Secondary school is a combination of junior highschool for 4 years (students aged 12–15) and senior highschool for 3 years (16–18). At the end of junior highschool, graduates receive a certificate, and at the end of senior highschool graduates receive their baccalauréat (equivalent of a highschool diploma). The University of Madagascar, established in 1951, has 6 separate Universities around Madagascar. The baccalauréat is required for admission to university. Our first cohort of ZAZA Scholars is about to enter their last year of junior highschool and hopefully will earn their certificate at the end of this school year. If they are successful, and their parents are supportive, their next step would be the 3-year senior highschool program. Please get in touch with me, or my mom (Jill) if you have any questions or would like to support the ZAZA Project in any way. 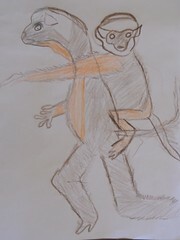 We would also be grateful if you shared our website (www.zazaproject.com) with anyone who may be interested. Thank-you so much for all of the support to the Expanding ZAZA Project. Together we are making a real difference! 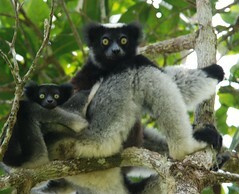 The team started working this week and they tell me that I already have 5 baby lemurs within my study groups!!! I have exciting news: The ZAZA Project is expanding! 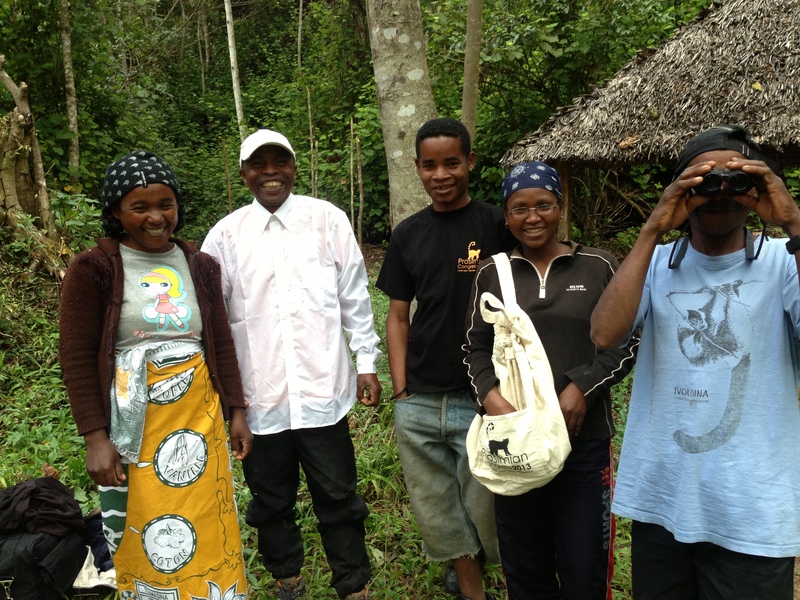 As many of you know, since 2011 we have been awarding ZAZA Scholarships to the top students finishing primary school in Anevoka, the village closest to Maromizaha Forest where I conduct my research on lemurs. Through the donations of thoughtful people all over the world, we are currently supporting 30 students in their schooling. One year of school for one student, including school fees, uniforms, notebooks, books, pens, pencils, geometry kits, pencil cases, coloured pencils etc. and room and board for 5 days a week during the school year (there is currently no secondary school in Anevoka) costs roughly $100. Most people in Anevoka are subsistence farmers and live off their rice and bean crops, they don’t earn actual cash, making it impossible for them to pay these school fees. Therefore, most children do not receive schooling past Year/Grade 5. 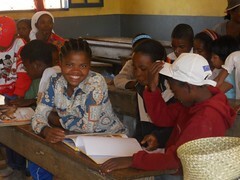 So far, the ZAZA Scholarship program has been an enormous success. Families of the students and the students themselves, beam with pride when they are awarded their scholarships at our yearly ceremonies. The scholars are chosen based on their academic achievement in Year 5, and the top 10 students from each graduating class receive the awards. I make it clear during these ceremonies that the award comes from people all over the world who care about them, and their continued education (not from me) and that support each year is contingent on donations and on the student’s continued hard work in school. I returned from Madagascar about 1 month ago, and I am now back in Kaikoura, New Zealand, studying penguins and dolphins and of course analysing my findings from approximately 14 months with the lemurs in Maromizaha Forest, Madagascar. As always, it was an incredible adventure. This time I participated in a week-long conference at Ranomafana National Park and presented my early findings on infant development in the Indri and the Diademed Sifaka. I also assisted with a project led by Dr Lisa Gould, further south in Madagascar, looking at ring-tailed lemurs living in tiny forest fragments. It was very discouraging at times to see so much deserted land, and so little forest, but we did meet a few local people trying to make a change to tourism and protection of the remaining forests, and that gave us hope. I also had the chance to visit Marojejy National Park in the north of Madagascar and see the gorgeous ghost-like Silky Sifaka. It was encouraging to meet Dr Erik Patel, who has been working in this region for over 10 years and has done SO much to help the animals and the people of the local communities. At Maromizaha, I was surprised to find that in 2013, no babies were born in any of my 10 groups, whereas in past years we have had bundles! It could be that this year the rain, temperature and hence plant food availability were not as favourable for lemur reproduction in this forest. Of course, zeros are numbers too! This information is valuable in my long-term study of their reproductive patterns. Last week, Madagascar held its first elections since the coup in 2009. These elections had been delayed several times over the past few years and it is VERY good news for Madagascar that they have actually occurred, and that it occurred mostly peacefully. It will take some more time before a new leader is appointed, as collecting and counting all of the ballots is a time consuming process in a country where some ballot stations are accessible only by foot! We hope that Madagascar will benefit from their new leadership and that the country will stay stunningly beautiful into the future. 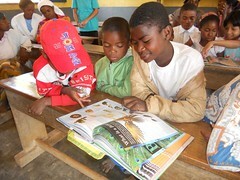 Thank-you for your part in keeping Madagascar, and the world, a beautiful place.